Comox Valley Zen (Chan): ...and a three hour retreat this coming sunday 1 to 4 p.m.
...and a three hour retreat this coming sunday 1 to 4 p.m.
"Life and death are of supreme importance. Time swiftly passes by and opportunity is lost. Each of us should strive to awaken. Awaken. Take heed, do not squander your life." 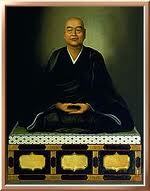 Dogen(1200-1253)issued his clarion call to revitalize Japanese Buddhism upon his return to Japan from China. He showed no interest in compromising or simplifying the practice that had been handed down by monks of Zen monastic communities for centuries in China and finally transmitted to him by the Chinese Caodong master Rujing. Dogen's community grew to be the Soto School in Japan. "Dogen's writings are always grounded in practical methodology: how to concentrate body and mind, how to understand and follow monastic rules, how to view various aspects of life and regulate daily conduct. He repeatedly emphasizes the interpenetration of practice and enlightenment. Practice here means ongoing daily activity centered in zazen. Enlightenment is actualization of buddha nature through practice." ...from Moon in a Dewdrop: writings of zen master Dogen, pg. 18. We will be meeting this Thursday and there will be a three hour retreat this coming Sunday 1 p.m. at Adrian's. RSVP please.